In our daily life, the smartphone is one of the most workhorses in contacting, entertaining, working and so on. 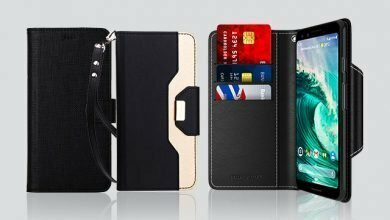 However, there is a way to leverage its benefits more – a suitable wallet case that provides some more storage space for our essential stuff. Thinking of it, with this little but powerful accessory, you are now able to go out without need of carrying much. It’s particularly convenient in hurry cases. 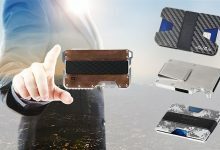 However, there are a wide range of wallet cases out there on the market with different construction, capacity, designs to fit diverse demands and requirements. On top of that, not all cases are equal in quality. That’s why my series of smartphone wallet reviews were born. 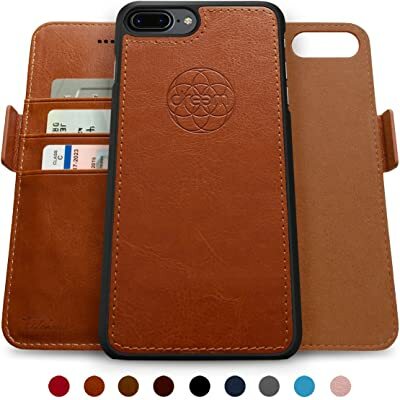 To continue it, in this article, I’m going to give you top 10 highly recommended iPhone 8 Plus Wallet Cases that bang for your buck. Read on! Beginning with an amazing iPhone 8 wallet case from ZVE. 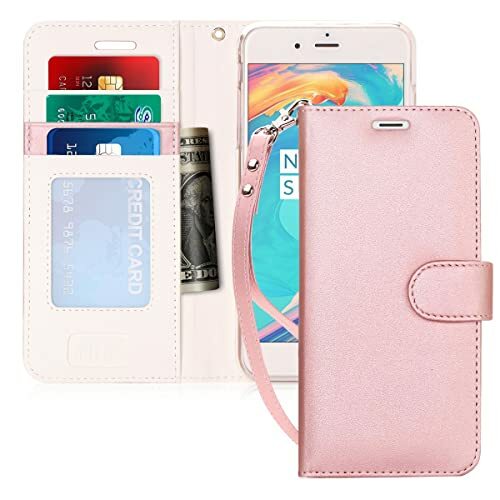 This is a well-known company specialized in phone accessories with three main product lines: the slim, the kickstand and the zippered wallet case. And this is one of the most functional zippered wallet cases for smartphone 5.5 inches. It’s like a normal phone case with a special integrated huge, spacious zip-around wallet on the backside. Inside this wallet, you will see two separate elastic card holders, each of which can accommodate up to 5 or 6. Totally, there are roughly 10+ cards stayed in this small yet streamline wallet. Or, if the number of your cards isn’t such that much, you can take advantage of some space left for cashes or bills, very convenient. And, the gap between two separate card holders is also ideal for your regular stuff like parking card, keys and so on. This wallet is quite closure and secure because its zipper is YKK, which is one of the most durable in the world. In fact, a piece of YKK zipper can stand 1000 times pull strength testing, which means it can bear abusing quite well. There’s also a lanyard to keep your hand free. 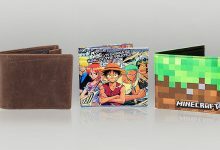 Now, I know that some people will wonder if this wallet case would slip out after tossing a lot of stuff inside, right? And, it’s a “No” from me. I got the same question right after receiving this product, but after testing with 10 cards and about 12 bills, it still hugs my smartphone so tightly. No slippery. No annoyance. Moreover, its warranty with up to 18 months ease my mind a lot to click that “Buy” button. 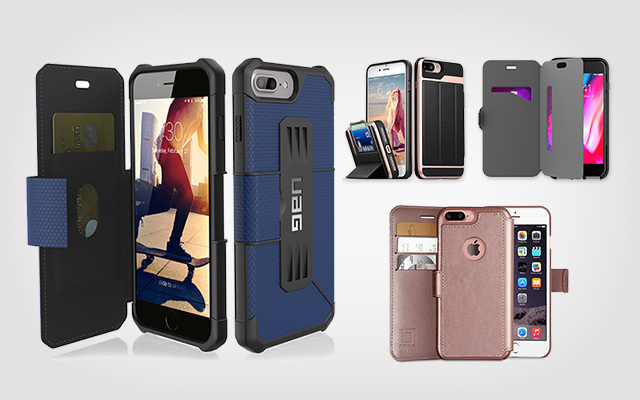 For slimmer and flatter design, I will recommend this UAG Folio. It also features a masculine, angular and lean outlook to be a perfect choice for men or women with strong characteristics. Two color options to choose from: red and blue. Thinking of it as couple stuff or a present is a great idea because of its nice design and interesting material texture. 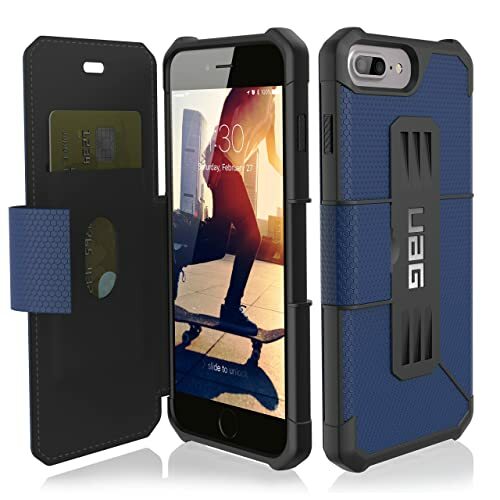 Take note that this UAG Metropolis wallet case is crafted from hard outer shell that meets military drop-test standards for the best shock absorbance. On the other hand, there’s a soft impact resistant core to hold your smartphone without leaving any scratches. I also highly recommend this UAG’s for card storage only. Or, maximumly, some small change as optional because you know it, the flatter the design, the narrower storage space it will provide. In other words, this is a great option for minimalist persons. About its capacity, you can put in about 1-2 cards and 2-3 folded bills as maximum to ensure its flat silhouette. As its wallet is on the frontside, opposite to the phone’s screen, some people are afraid of the numbers embossed on bank cards might cause scratches to its screen. I have also tested this issue but find nothing left on my smartphone. If you are a careful person, simply coat the screen with a tough screen protector. 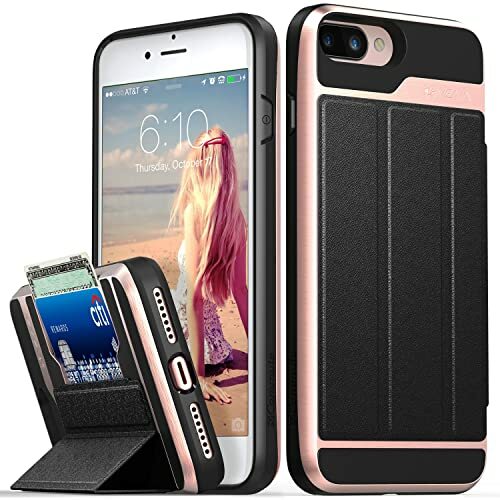 If your concern is all about Apple Pay or other wireless charging compatibility between your smartphone and this case, just rest assured. They work perfectly. 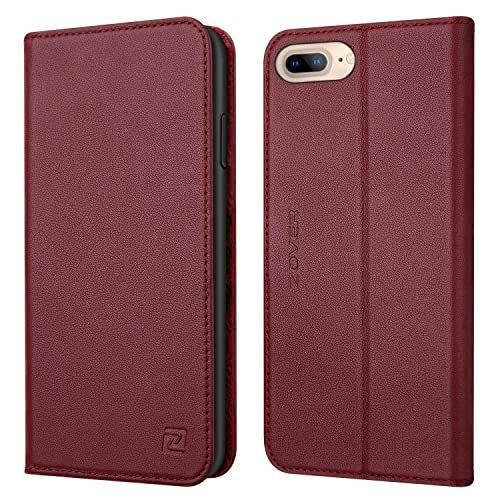 If you are looking for a wallet case that is an average between two previous models, ZOVER is the best bet. Its storage space is large enough to fit 3 regular cards and 5-9 bills. Particularly, they will be kept straightly. 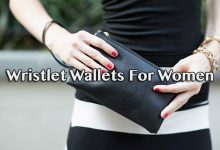 But the best thing is this wallet case comes up with a perfect compromise of huge storage space and flat silhouette. Absolutely no bulk! Besides, its curved edges fit snugly to your smartphone to stay neatly in your back pocket without difficulty. Figure as a flip-aside iPhone 8 plus wallet case, to keep it shut when not in need, the manufacturer attached a suction cup. Don’t worry, this extra detail is quite screen-friendly to leave no scratches or effects to iPhone signals. Moreover, it protects your phone screen better. Another great benefit of this suction cup is a temporary, convenient kickstand so that you can watch movies, videos or chat with friends more conveniently and hand-freely. Speaking of the material of this wallet case, it’s guaranteed to use 100% genuine leather with unique veins and natural pores on its surface to make every single case be distinctive against each other. But here is where the real fun begins, differ from other leather wallet cases, this one from ZOVER has been soft environmentally certified to deliver special soft hand-feel but not fragile. This mostly thanks to the double tanned under gold-rated LWG environmental protocols – perfect for those who pursuit the excellence and perfectionism. Last but not least, ZOVER also attached a beautiful packaging with luxurious outlook for those who intend to give this as a special gift for somebody. The very first thing I like about this wallet case is its various choices of colors and patterns. FYY allows you to go simple or floral depending on your preference. But moreover, each single option is really beautiful and outstanding, which I can assure that you will definitely at least one favorite there. Now, back to the functionality of this case, one feature that I haven’t seen in other designs in this list is RFID Blocking Technology, which can be arguably an outstanding benefit of FYY case. I highly recommend it for those who usually travel abroad or are living in a country with high risk of RFID thieves. This invisible feature delivers huge benefit and protection to your personal information, especially the bank identity information to save you from many cases of losing a huge amount of money because of illegal RFID scanning. Aside from that huge bonus, there is some other convenience like the kickstand, the magnetic closure strap and a removable wrist strap to keep your hands free. Particularly, thanks to the design wise for easy access to all controls and ports, you can talk to your friends via phone with no need of opening the flap. Besides, feel free to film or take a picture with this phone case without taking the case off. If you are a vegetarian, there’s another good news – the material of this wallet is 100% high-quality PU leather to give you two biggest benefits: durability and no animal killed for human uses. And here, this wallet case is a perfect choice for those who prefer a slim silhouette that enable to toss in your back pocket but don’t like the wallet placed in the frontside. It should be the best bet for careful persons with fear that your regular stuff will cause injures to your smartphone’s screen. However, this type of wallet case won’t affect Apple Pay and other wireless functions. Speaking of its storage space, there’s one slot fitting snugly 1-2 cards and 2-4 folded bills. Again, this is a case for minimalist persons or those who want to carry less. Out of this distinctive feature, this wallet comes up with some similarities like other products, like precise cutouts, tactile buttons kickstand for more conveniently watching videos, films or chatting at desired comfort and angle. In terms of material, for the best durability, this wallet case is crafted from premium polycarbonate and TPU that have been military grade drop certificated with Cornerguard TM technology. In fact, it can bear 26 drops from 4 feet high with no side effects to its inner stuff. Speaking of the CornerGuard technology, it brings better protection to four corners of your smartphone. If it has been failed many times, chances are that you will know how fragile and easy to damage of these areas. That’s why I found this added feature is quite thoughtful, genius and convenient, especially for an absent-minded person like me. Also, you don’t have to worry about its craftmanship or cutouts. If you own a car and usually use your smartphone here, this is another biggest bonus for you – the Vena wallet case can be compatible with magnetic car mount for more convenient use. Tech21 is a new comer in the wallet case market, but they gain my trust and love due to their products’ high-quality material and great protection. I don’t know which kind of material it is made out of but this wallet can absorb shock quite well to keep the whole smartphone from back to front, especially the screen and four corners. I personally admire its triple layers of impact protection to save your smartphone against 3-meter drop. These layers include an outer shell for cushioning the impact, a skeletal frame for spreading the impact energy and the flexshock for absorbing the remaining impact energy. Might triple layers sound bulky to the ears, but in reality, it’s quite slim, flat and even lightweight. Unlike other protective wallet case, this one is really feather light, which is something hardly see in other high-quality products. Besides, if this is your very first time trying any product from this brand, also feel ease in mind because they come in limited lifetime warranty. You will find this Dreem Fibonacci wallet case to be your best companion in life if you use your smartphone for almost things, from entertainment to work, from answer emails, video call to business partner, read documents to watch movie, chat with friends. Or, it’s also utilized to track location or find direction in online map while driving. It’s because there is a vertical and horizontal kickstand integrated in this product. Besides, you just need a few seconds to mount it to any magnetic car mounts or selfie sticks. To reach such that convenience, it’s thankful to the removable flip-case design with powerful magnetic strap to deliver both function: protection and practicality. However, this doesn’t effect on other wireless functions of your iPhone or the RFID chip attached on your bank cards. On top of that, its RFID Blocking Technology is another great bonus. As mentioned above, this feature is must-have feature in any kinds of wallet to protect your essential information better. 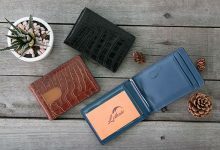 Now, speaking of the wallet construction, there are three card slots and one full-length bill compartment that can hold up to 6 cards and 10 bills at the same time, but still keep the slimmest silhouette to toss in your back pocket easily. If you wonder about its material, this hand-crafted wallet case is made out of high-quality faux leather. Its elegance and sophistication are also shown through its beautiful stitching, strong seams with wise cutoff and curved edges to deliver great luxurious look. 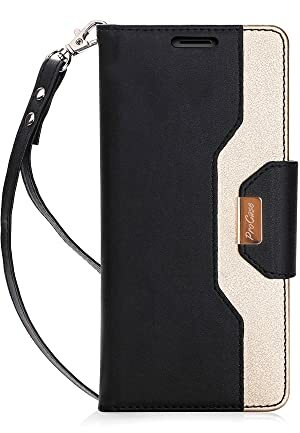 I highly recommend this ProCase iPhone 8 Plus Wallet Case for women because aside from its exquisite craftmanship, stylish design, moderate capacity, it is also equipped with an extra mirror to check your makeup when in need without looking for one in your bag. This convenient mirror is attached under other two card slots, sided one full-length bill compartment. Speaking of the cutouts of this wallet case, it’s another compliment of how well thought the manufacturer is. All features like speaker, buttons and ports and cameras are fully accessed. There’re more, built-in kickstand that allows you to use the smartphone in various viewing angles, hand wrist strap to keep your hands free, and magnetic closure. 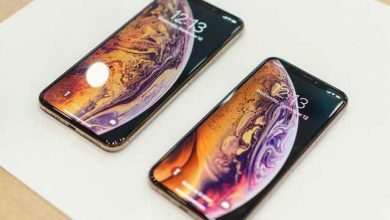 As the whole wallet is placed on the frontside, you don’t have to worry about how efficient it works with Apple Pay and other wireless functions. There is just one inconvenient – there’s no lining. Can’t deny that the premium composition genuine leather material in both side – interior and exterior – is a great thing for advanced protection. However, with no lining, it’s quite easy to stick to the cards if you leave them there a couple of days without using. 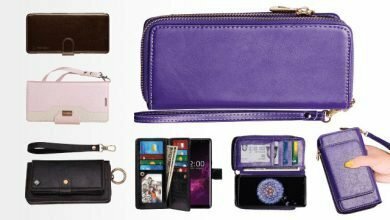 If you decide to choose this wallet case from ProCase, make sure to put in only your regular stuff there. 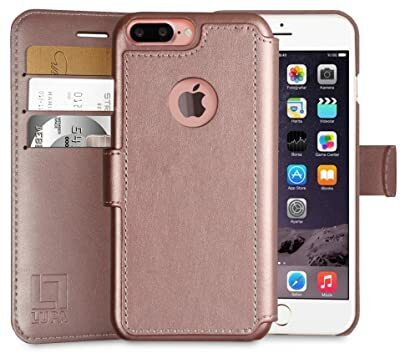 Two reasons make me decide to add LUPA iPhone 8 Plus Wallet Case into this must-try list are its extra screen protector and the elegant gift box. Sound inconclusive a bit, right? But thinking twice, this option might be what you are looking for. Take note that this is a front-wallet design that all cards and bills will be placed on the frontside. It also means that a part of the cards will directly contact to your smartphone’s screen. In this case, a screen protector is very useful to prevent any unexpected scratches or injuries though this issue is rarely happened. I think careful individuals should consider this design because of their thoughtfulness. Now, before talking about its gift box, I have to talk about its functionality and quality first. In wallet case world, LUPA is one of the well-known brands for high-quality products. Like this model, it’s crafted from rugged, lightweight and eco-friendly PU leather with nice texture hand-feel and great durability. Besides, its protection level is quite high that can stand drop on the ground or occasional splash. Plus, the raised edges and four-corner covers leverage its protection significantly. Though LUPA’s design is quite popular with 3 card slots, 1 full-length bill compartment, magnetic strap, and precise cutoffs, can’t deny that it brings great benefits to our daily life, especially help us travel lighter. On the other hand, it comes up with a reliable guarantee to ensure your purchase satisfaction. Not saying that its design is quite beautiful, simple yet elegant to be perfectly a present for somebody. Understand that demand, they provide a beautiful and luxurious gift box so that you don’t have to buy one. You see? Though these two extra things seem not great or magical, they meet just right to what we need, and that’s also what I’m looking for. How about you? 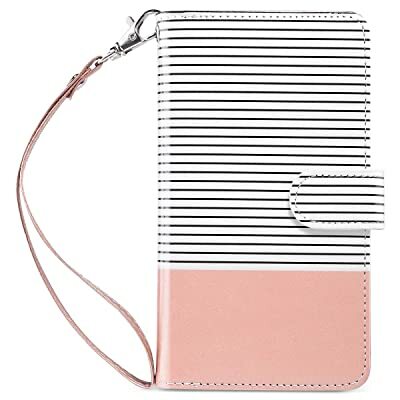 Last but not least, I highly recommend this ULAK Wallet Case for traveling because it can take both roles perfectly – a wallet and a phone case. On top of that, it keeps a whole flat silhouette to be a perfectly stylish accessory. 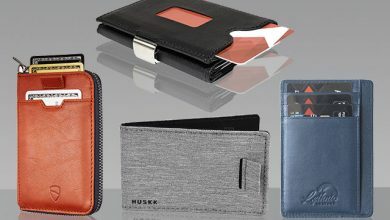 Differ from other wallet cases you have met in this list, ULAK’s capacity is totally in a higher level with really spacious yet streamline storage space. There are 9 card slots, 1 full-length bill compartment. But the best thing is they won’t contact directly to your phone’s screen anymore. Plus, there’s a clear ID window for quick access your IDs or driver license. You don’t need to worry about its quality because both the case and the wallet is made out of premium material. Detailly, the frame is crafted from poly carbonate whilst the rest is high-quality PU leather for all-in-one protective solution. Its precise cutouts are another great bonus to help you easily access to all functional buttons and ports. Lastly, to keep the whole wallet case closed, there’s a magnetic strap. Plus, a removeable wrist strap to keep your hands free. 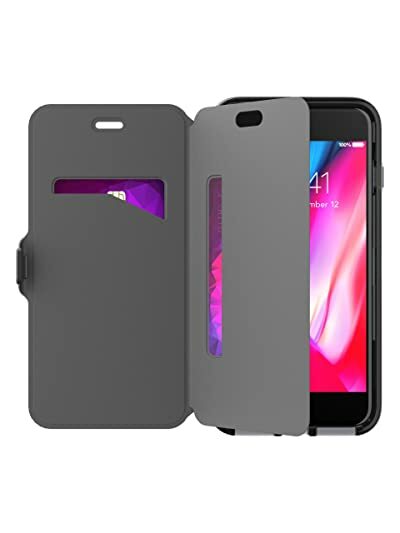 There’s just one drawback of this design – you can’t answer a phone case until opening the flap because there are no specialized cutoffs for the phone speaker. 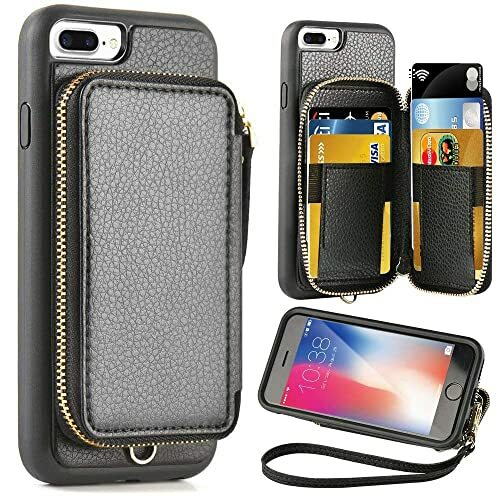 I have just listed out and reviewed detailly a wide range of iPhone 8 Plus Wallet Cases. 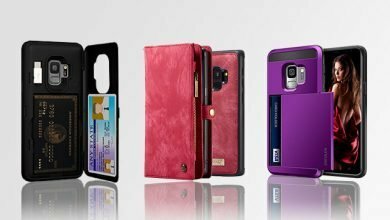 As it’s quite diverse, you need to identity clearly what you need as well as your preference in a wallet case to save more time when considering the most suitable model. This round-up collection is like a hint and also a recommendation for different needs and favorites that direct you to the final choice. Each single product listed here is all high-quality with guaranteed warranty. They meet a certain need of wallet case for iPhone 8 Plus. However, you should take note that this type of wallet just helps you in some cases in your daily, you still need a main wallet to put in all essential stuff there like bank cards, member cards, IDs, driver license, bills, documents, coins and so on.